BEIJING, Nov. 30, 2018 /PRNewswire/ — China’s national forestry and grassland administration has recently honored regional government officials, individuals, and enterprises who have made remarkable contributions to the Three-North Shelter Forest Program. Wang Wenbiao, Chairman of Elion Resources Group, last year’s winner of Lifetime Achievement Champion of the Earth from the UN Environment Programme, was awarded the Green Great Wall Medal. The year 2018 marks not only the 40th anniversary of Reform and Opening in China, but also the 40th anniversary of China’s mega afforestation project — the Three-North Shelter Forest Program, also known as the Green Great Wall. Initiated in 1978, the program was planned to last 70 years, creating a 4,480km long green belt along China’s north frontiers to hold back the expanding Gobi Desert, and prevent soil erosion, land degradation, and now it has taken on additional importance for storing carbon dioxide to tackle global warming. With an estimated investment of 5.5 billion RMB, the program has created a total afforestation area of more than 30 million hectares in the past 40 years, which has increased the forest coverage from 5.05% in 1977 to 13.57% and has helped reduce 11,479 km² of desertified areas in the three northern regions of China between 2009 and 2014 alone, according to the administration. The Kubuqi Desert, located in Inner Mongolia, is the seventh largest desert in China, with a total area of 18,600 km2. It is also the closest desert to Beijing and used to be one of the major sources of sandstorms hitting Beijing and the Tianjin Region. Over the past three decades (the Elion Kubuqi Greening Project started in 1988), Elion has devoted persistent efforts to have restored one third of the desert and lifted more than 100,000 local residents out of poverty by developing eco-industries, such as solar power generation, tourism, and desert agriculture, in the Kubuqi Desert. As evaluated by the UN Environment, Kubuqi has been generating more than 72 Billion USD green wealth based on eco-restoration. The annual income of local residents has been raised from less than 110USD per capita to more than 2,500USD per capita. Kubuqi is now recognized as a green economy model by the Chinese government and the UN Environment Programme. The Kubuqi model is now being shared in other parts of the world as Elion expands its business in African countries, including Nigeria and Morocco. “Since the reform and opening up, the Chinese government has been encouraging private sectors to participate in public programs,” Wang said. “The Kubuqi model is a vivid example of this type of partnership, and it actually helps, because as a private company, we want to make sure every dollar we spend counts, so we are motivated to develop our technologies and enhance the survival rate of the saplings, also to focus on economic crops. Apart from Kubuqi, Elion is also responsible for another section of the Three-North Program in Hebei Province for the 2022 Winter Olympic Games. “China effectively succeeded in not only halting the desert but in reversing the desertification. The Three-North program is the world’s largest afforestation and reforestation program and also a resounding success. This program has made a highly significant contribution to the global efforts towards protecting the eco-system and maintaining eco-system security,” said Alexander Buck, the executive director of International Union of Forest Research Organizations (IUFRO) during a meeting in Beijing for the 40th anniversary of the Three-North Program. Indeed, tackling global issues such as climate change and desertification requires united efforts worldwide at all levels. Not only China but also African countries are building their wall of trees to fight against desertification. 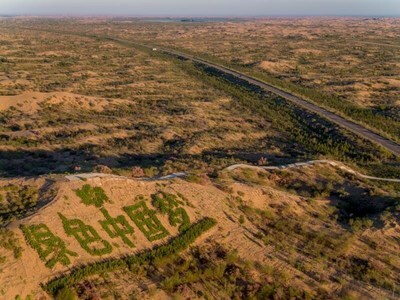 Launched in 2007, the Great Green Wall, is an African-led movement with an epic ambition to grow an 8,000km natural wonder of the world across the entire width of Africa. The Wall promises to be a compelling solution to the many urgent threats not only facing the African Continent, but the global community as a whole – notably climate change, drought, famine, conflict and migration.